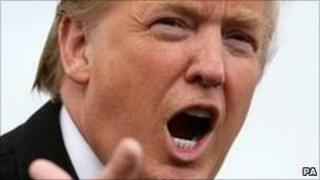 American tycoon Donald Trump is to receive an honorary degree from Aberdeen's Robert Gordon University. Mr Trump has divided opinion after vowing to build the "world's greatest golf course" at Menie in Aberdeenshire. RGU said he would be presented with the honorary award of Doctor of Business Administration on Friday 8 October. The university said the honour recognised Mr Trump's "business acumen" and the future his company is planning in the north east of Scotland. The Trump Organisation said it was a "tremendous honour" for Mr Trump. However, the Tripping Up Trump campaign group said in a statement: "The only award Donald Trump is worthy of is an Asbo for his destructive, threatening and intimidating behaviour at Menie." Work on Mr Trump's controversial golf course got under way earlier this year. The billionaire believes the total cost of the project is likely to be about £750m. Some local people have refused to sell him their properties.